For pediatric patients with suspected acute appendicitis, ultrasonography has the potential to prevent ionizing radiation exposure, while reducing the time needed to make an accurate diagnosis. 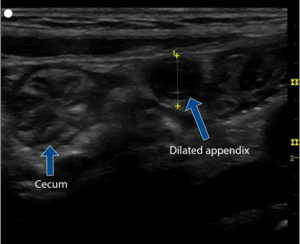 This observational study investigates the diagnostic accuracy of pediatric emergency medicine physicians performing focused ultrasound of the right lower quadrant to evaluate for acute appendicitis. A total of 13 pediatric emergency medicine physicians participated in the study after having received didactic instruction and hands-on training in sonographic scanning techniques for acute appendicitis. Clinical and radiologic findings were utilized for assessment agreement following each sonographic examination. The study found that the physicians had high diagnostic accuracy (97.9%) for diagnosing acute appendicitis when visualization of the appendix was clear. When visualization was unclear, physicians maintained high confidence but lower diagnostic accuracy due to false negatives and false positives. This study supports that pediatric emergency medicine physicians with proper training are able to reliably diagnosis acute appendicitis in pediatric patients using bedside ultrasound. Sivitz AB, Cohen SG, Tejani C. Evaluation of Acute Appendicitis by Pediatric Emergency Physician Sonography. Ann Emerg Med. 2014;64(4):358-364.e4. doi: 10.1016/j.annemergmed.2014.03.028. We investigate the accuracy of pediatric emergency physician sonography for acute appendicitis in children. We prospectively enrolled children requiring surgical or radiology consultation for suspected acute appendicitis at an urban pediatric emergency department. Pediatric emergency physicians performed focused right lower-quadrant sonography after didactics and hands-on training with a structured scanning algorithm, including the graded-compression technique. We compared their sonographic interpretations with clinical and radiologic findings, as well as clinical outcomes as defined by follow-up or pathologic findings. Thirteen pediatric emergency medicine sonographers performed 264 ultrasonographic studies, including 85 (32%) in children with pathology-verified appendicitis. Bedside sonography had a sensitivity of 85% (95% confidence interval [CI] 75% to 95%), specificity of 93% (95% CI 85% to 100%), positive likelihood ratio of 11.7 (95% CI 6.9 to 20), and negative likelihood ratio of 0.17 (95% CI 0.1 to 0.28). With focused ultrasonographic training, pediatric emergency physicians can diagnose acute appendicitis with substantial accuracy. To read the article, visit the Annals of Emergency Medicine website.